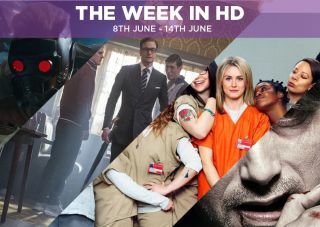 The Week in HD: Kingsman: The Secret Service, Orange Is the New Black, Hannibal and more | What Hi-Fi? Based on Mark Millar's graphic novel which took a 'yoof' and turned him into James Bond; the film adaptation casts Colin Firth as a gentleman spy and Taron Egerton as his apprentice. Sam Jackson plays the villain with a lisp and his henchwoman (Sofia Boutella) shops at the Sharper Image catalogue for super villains by having blades for legs. Riffing off the Roger Moore era of Bond, Kingsman is funny and violent, with a couple of fantastically shot scenes (including one set in a church). Like most of Millar's work it's not as clever or as subversive as it thinks it is, with director Matthew Vaughn going full steam ahead with one joke in particular that's at best misjudged and at worst distasteful. But that's Kingsman in a nutshell – prepare to be entertained and offended in equal measure. Strange, hazy and idiosyncratic, the latest film from Paul Thomas Anderson is very good once you settle into its rhythm. Joaquin Phoenix plays Larry 'Doc' Sportello, a private investigator in ’70s Los Angeles on the case of a missing landowner who may – or may not– have something to do with the disappearance of Doc's former squeeze, Shasta Fay Hepworth (a radiant Katherine Waterston). Take Vice in its languid stride and you'll be taken in by its charm and goofball humour. The plot is dense though, and at two-and-a-half hours it is a long film to sit through. Trash slipped through the net of cinemas but you can catch it now on Blu-ray. The plot follows three kids from a Brazillian favella who come across a wallet in a garbage dump that's more valuable than they could have imagined. They soon find themselves in the crosshairs of the police and go on the run to prove their innocence. Trash features some actors you recognise (Rooney Mara, Martin Sheen) and some you may not (Wagner Moura from Elite Squad), but it's the vibrant performances of the three kids at the centre of the plot that makes this energetic and gritty crime film a recommendation. The best of the week's releases is led by... the not-so-good crime caper Mordecai starring Johnny Depp and his odd curly 'tache. Then there's Ewan McGregor's crim who takes Brendow Twaites as his bank-robbing apprentice in Son of a Gun. For Blu-ray collectors Monty Python & the Holy Grail gets a steelbook reissue while the film that almost caused World War 3, The Interview starring Seth Rogen and James Franco, gets a bog-standard standard and limited edition steelbook release. Can anyone remember what the fuss was about? Rounding up the list of feature film releases is Kajaki, a tense thriller based on a true story that saw a company of British soldiers stranded in the desert surrounded by landmines. And with Terminator Genisys out in a few weeks, the first four Terminator films have been re-released as a box set (watch the first two, consider the third, give Salvation a miss). On the TV front series 1-3 of Luther arrive in a boxset; with the ninth series of Supernatural, the fourth series of Suits and BBC's The Game bounding on to Blu-ray. Sweden vs. Nigeria. The Women's football World Cup is up and running, and the usual suspects of Brazil, Germany, Sweden and the USA are among the favourites. The Dance of Dragons. We're approaching the endgame of Game of Thrones fifth series, and after the excitement of last week's episode events continue at pace as Stannis has to make a troubling decision and Jon returns to the wall. The description for this episode also mentions 'distressing scenes', in a program full of them what could the hot-button topic be this week? England arrive for this one-day international with low expectations. A poor World Cup has been followed by even poorer performances, and with a young squad up against World Cup finalists New Zealand, favourites they most certainly are not. Our Dancing Days. There's tension at Empire Entertainment (isn't there always?) As Luscious attempts to brand EE as a more tightly knit company, the move causes friction between Hakeem and Jamal. That's not the only problem Luscious faces as Cookie and Anika are stepping up their attempts to take over the company. Glorious Horrors. Poor Vanessa, she never has much fun at parties. This time it's Dorian Gray's lavish ball that ends up being too much for her. And the secret is out for Ethan as Sembene figures out what he's hiding. Antipasto. If you've been hungry for more Hannibal then your appetite is about to be sated with the first episode of the third series. Anipasto sees Lecter living under a new alias in Florence, Italy with Bedelia Du Mariner. But he can't resist teasing Will Graham and sends him a little valentine. How… weirdly... romantic? Chapter Eight. Xiomara looks to have made it in the music industry when a producer contacts her to record a demo. Things, however, don't quite turn out as she anticipated. In more Jane-centric news, she and Rafael share some shocking personal secrets. The first in a new BBC series that sees historian Andrew Roberts explore the life of Napoleon - one of history's sorest losers. But his rise to power was impressive as this documentary shows, from his early beginnings as an officer in the Corsican Army to eventually becoming the First Consul and Emperor of France. Interesting. It feels like the relationship between Noah and Allison has been heating up for a while, but this week it really does get steamy. That's down to Noah learning that there's more to Allison than he was led to believe. Is this a good or a bad thing? Stallone and gang return to dish out some old-school violence as they go up against the wonderfully named, former Expendable Conrad Stonebanks (Mel Gibson). There are more famous names in this than you can shake a Hollywood agent's phone at. A film that's sparked one or two arguments in the office (it's much better than At World's End). Johnny, Keira and Orlando reprise their roles in this Empire Strikes Back-like sequel. Bill Nighy as the wonderfully realised Davy Jones is the real reason you should watch. One of the best CG characters ever. Hollywood classic The Wizard of Oz arrives on Prime Instant with Judy Garland's ruby red shoes glittering in shiny HD. Still the best, and most memorable, film to come from Frank L. Baum's books (although Return to Oz with its Wheelers spooks us every time). Scarlett Johansson develops superhuman abilities in this thriller from Luc 'The Fifth Element' Besson. Agreeably loopy, although for a film that sees a character ingest a substance to stay on top of events, it could do with some of it itself. That, and a lot more activity in the brain area wouldn't go amiss. The Truth. Wayward Pines reaches its mid-way point and it looks as if we're finally getting some answers. Newly appointed sheriff Ethan Burke makes some shocking discoveries as he starts to put the pieces together. Marvel Studios head into outer space with Guardians of the Galaxy, a film that was better than anyone expected. Uniting five intergalactic criminals, they put aside their differences to stop Ronan the Accuser from destroying the galaxy. It's great fun, although the villain is another weak one from MCU's pantheon of rogues. The England U21 squad continue to prepare for Euro 2015 in this warm-up. Will they, like the senior team, get our hopes up before crashing on the rocks of an international tournament? A few players are missing, but this is as good a chance as the U21 team has had – probably since they were battered 4-0 in the finals back in 2009. Ouch. SOS Part 2. The second series of Agents of S.H.I.E.L.D concludes as Coulson and his team go up against the Inhumans. Agents is now a much more confident series, and the ending brings to a close several storylines while setting up a few more that will leave fans pondering what the future holds. Netflix returns to the stomping grounds of Litchfield Penitentiary woman's prison for the third series of Orange Is the New Black. Not much is known about the plot, but we can expect several new characters including Mary Steenburgen as the mother of George 'Pornstache' Mendez. Expect laughs, rowdy behaviour and the kind of clever humour that's made this series such a hit. Le Mans 24 Hours – Pick of the Day, all day! Twenty-four hours of motor racing. Twenty-four hours! Audi will be looking to bag another win – perhaps before it registers an interest in F1? Speaking of F1, Nico Hulkenberg – currently a driver for Force India – will be driving for Porsche. Hitchcock's Rebecca sees Lawrence Olivier's Maxim de Winter marry Joan Fontaine's shy, naive young woman and take her back to his mansion called Manderly. But soon after, she begins to be haunted by the spectre of his dead first wife. And that's not the only strange thing happening. The housekeeper, Mrs. Danvers, turns out to be a thorn in the new Mrs de Winter's backside. Rebecca is a taut gothic horror and looks gorgeous in black and white, but there has always been something holding us back. Perhaps it's because it moves at a pace so slow it threatens to put us to sleep. The point where the Harry Potter series grew up, in part thanks to Alfonso Cuaron. Dropping the kiddy shenanigans of the first two films, Azkaban is a darker and more mature take that set the benchmark for the rest of the series. All three lead actors up their game but it's the supporting cast that's a brilliant as ever, with Gary Oldman fantastic as Sirius Black. England could move a step closer to qualifying for Euro 2016 with a win in Slovenia. They'll have to better their limp performance in the recent friendly against the Republic of Ireland which was lacklustre in the extreme. Arabella. Strange and Arabella's plans are ruined by The Gentleman's appetite to exact revenge. Magic Mike is a film about male strippers. But it's not that kind of film about male strippers (well, it sometimes is). It's a decidely un-Hollywood take on the material with the titular Mike (Channing Tatum), wanting to make enough money to start his own furniture company (exciting). Problems keep rearing their tanned, well-coiffured heads in Alex Pettyfer's delinquent Adam and a welcome distraction in Cody Horn's potential love interest Brooke. A decent warm up for the sequel out this summer (Magic Mike XXL), which is absolutely that kind of film.